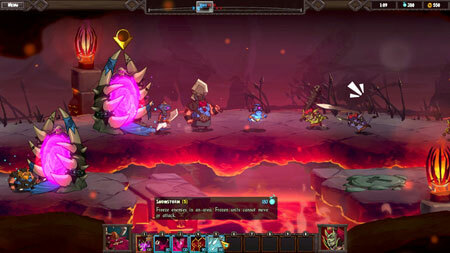 Swords and Soldiers 2 Shawarmageddon is an action-packed side-scrolling real-time strategy game from Ronimo Games. Fight to control the map and push the enemy back to their base in a highly tactical tug of war. Battle in online and split-screen multiplayer, duel the devious AI in skirmishes, or enjoy the extensive single-player campaign. Take command of mighty Vikings, sly Persians or brutish Demons. Destroy your opponent’s base while defending your own. Mine valuable gold so you can unlock any of the 50 units, buildings and spells that suit your playstyle, then unleash your armies and magical powers to counter your opponent’s strategies. The campaign gives you command of Redbeard and his Vikings. Join them as they fight their way through the forests of Vikingland, the scorching sands of Persia and even the nether regions of Hell, on a quest to retrieve the sheep that have been stolen from their favourite shawarma shack. Play any of three deadly factions including Vikings, Persians and Demons, each with their own unique units and spells as well as distinctive strengths and weaknesses. As Chief Redbeard, you and your Vikings must fight your way through an extensive 45 level single-player campaign across tundra, forests, deserts and the pits of hell. If you get stuck in the game, check out the video walkthrough and gameplay for the game. This entry was posted in PC Games, Walkthrough and tagged Swords and Soldiers 2 Shawarmageddon Cheats, Swords and Soldiers 2 Shawarmageddon Game, Swords and Soldiers 2 Shawarmageddon Gameplay, Swords and Soldiers 2 Shawarmageddon Guide, Swords and Soldiers 2 Shawarmageddon Hints, Swords and Soldiers 2 Shawarmageddon Review, Swords and Soldiers 2 Shawarmageddon Solutions, Swords and Soldiers 2 Shawarmageddon Strategy, Swords and Soldiers 2 Shawarmageddon Tips, Swords and Soldiers 2 Shawarmageddon Walkthrough by Marvin. Bookmark the permalink.